A SOUTH Belfast mother and son are facing deportation as Home Office officials prepare to send them to Nigeria. Favour Egbomeade and her son Osareuse (10) have made a home and lives for themselves in the Ormeau area. Osareuse was born in the Rotunda Hospital in Dublin in August 2006 – mother and son then found themselves in the “direct provision” system. 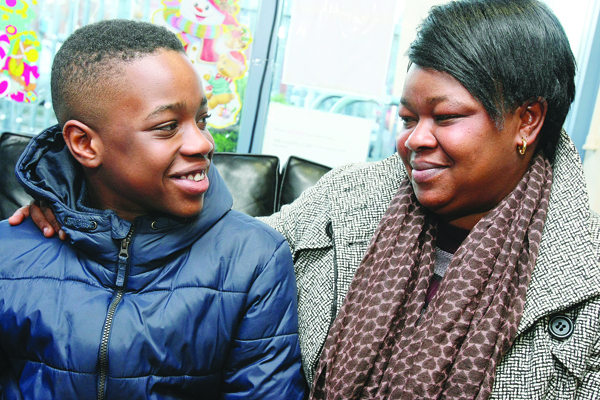 After seven years of waiting for her asylum claim to be dealt with, Favour decided that, for the sake of her son, she needed to move to Belfast. She claimed UK asylum in May 2013. Since then, Favour and Osareuse have immersed themselves in their South Belfast community with Favour volunteering with the South Belfast Foodbank, LORAG and City Church Belfast. Osareuse attends St Malachy’s Primary School in Eliza Street and sat his transfer test last Saturday. The South Belfast News met with Favour, Osareuse and some of their support network to discuss Favour’s case. An emotional Favour was too upset to speak and relied on her friends from the various organisations she’s involved with to speak on her behalf. Jennifer Bell of LORAG said: “We have a lot of inter cultural event days in LORAG, Favour would host the Nigerian table, she is also part of our inter-cultural parenting group, we meet every Tuesday and do various arts and crafts activities as well as discussing with each other various cultural backgrounds and histories. Favour is very active within the community,” she said. Bruce Gardiner-Crehane, Manager of the South Belfast Food Bank, added: “We set the Food Bank up in 2014, it’s an initiative of City Church and with Favour being a part of the church she heard about it and right from the word go she was keen to give up her time to volunteer. “What makes her contribution special and unique is that she herself is an asylum seeker and we work with quite a lot of them and she is able to bring that strength and support to them, she empathises and offers help where she can. Osareuse attends St Malachy’s Primary School. He has never lived anywhere besides the island of Ireland and speaks with a strong Belfast accent. His Principal, Dermot Flynn, is concerned that all the worry and stress could affect the primary seven pupil’s studies. He said: “We regard Osareuse as a prime example of a success story, the challenges he faced were extremely great. Osareuse faced many, many challenges and overcame them. Suzanne McKeown of Tim McQuoid Solicitors said: “We are trying to prevent the Home Office from removing them, while at the same time we have made an application to the Minister of Justice and Equality in the south to have Osareuse made an Irish citizen because he was born in Dublin. She added: “Osareuse is thriving in school and Favour is well known in the local community. Her asylum claim has been rejected several times, with the High Court recently refusing to grant leave to seek judicial review of the last decision by the Home Office to reject her further submissions. As a result, the Home Office is now gearing up to remove mother and son to Nigeria. Favour’s parents are both dead and she has no contact with extended family. She will not be able to raise the money to put her son into school in Nigeria.